Late 16th Century Japan forms the backdrop for what appears to be another masterpiece in the making at From Software. 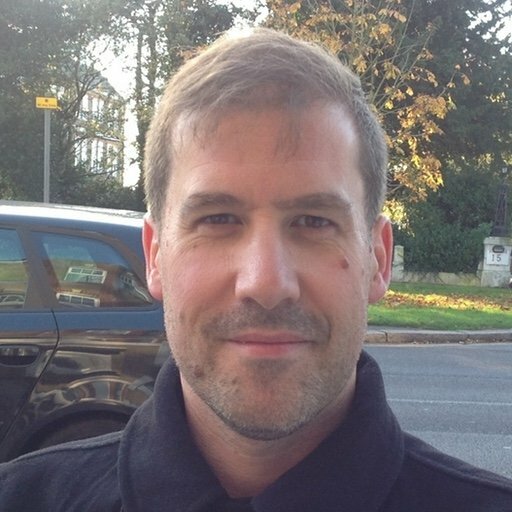 How will the studio behind Dark Souls and Bloodborne shock and surprise us this time? An E3 trailer and behind-closed-doors demo had much to reveal. Souls fans have much to be excited about with Sekiro: Shadows Die Twice, starting with the fact that Hidetaka Miyazaki is directing. Miyazaki has earned rock-star status among gamers owing to credibility of titles going all the way back to Armored Core: Last Raven in 2004, and most recently Bloodborne, the PlayStation 4 exclusive published by Sony. The good news for everyone is that Sekiro: Shadows Die Twice is destined for Xbox One, PlayStation 4 and PC, with a release date of ‘Early 2019’ that appears to be worldwide. 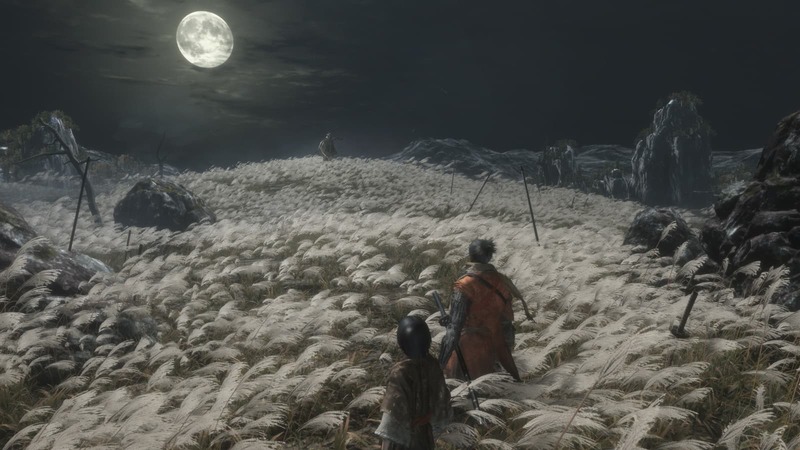 While there are similarities between Sekiro and the Souls series, it is already clear that the gameplay is very different. The Sekiro of the title translates as “one-armed wolf”, in reference to the essence of the lead protagonist, which we’ll get to shortly. Before that, let’s talk about the theme. Miyazaki’s latest is set in the ancient Sengoku period of Japanese history, and its ‘warring states’. The beauty of old Japan, from the nature to traditional architecture, is very much a part of how players are hoped to appreciate the visual flow. It contrasts with the dark, and mysterious themes that infuse the gameplay. There’s a very distinct Akira Kurosawa flavor to it all. Shadows Die Twice is the kind of game that arcade titles of the late 80s made us dream of. At the center of it all is our hero, a shinobi in service of a prince, effectively a ninja-trained bodyguard who acts alone, as opposed to being a commander. The unusual thing about our shinobi is that he lost half of his left arm while defending the young prince, which has been replaced by a sweet “Ninja Prosthetic” created by the Busshi of the Desolate Temple, who is described as a hermit residing in a remote mountain location. He too is missing one arm... The crudely manufactured limb is mechanized to include ingenious weapons and tools, for use in battle and area traversal. There’s more to the hermit’s past, as there is to the prince’s heritage, but the focus for now is the enemy and how this one-armed wolf comes to blows. There are shades of Resident Evil in Shadows Die Twice, as we learn of the land of Ashina and an ancient clan from whom the prince is descended. The Ashina people had expanded to the north, but now find themselves in peril. Somehow the prince holds the key to their survival, so he is captured. When the prince’s guardian, our shinobi, sets out to rescue his master, he encounters monstrous giants and their minions, requiring every ninja smart he ever learned to bring down. Rumor has it that there is a parasitic element to the enemies, which might help to explain their abnormal appearance and bizarre tendencies. We face a towering sword-wielding samurai that spews poison onto his blade; a huge prisoner breaks free of his stocks to manhandle the hero; and an armored rider sweeps an overlong spear. Most of the action centers around the shinobi’s ninja-prosthetic left arm, that magically transforms into an axe to break through enemy shields, or a shield to deflect blows. It also comprises a grappling hook, used to traverse areas at speed and close distances between opponents. In his right hand, the shinobi carries a katana. He is also equipped with shuriken, and may toss flash-bombs that cause temporary blindness and concussion. 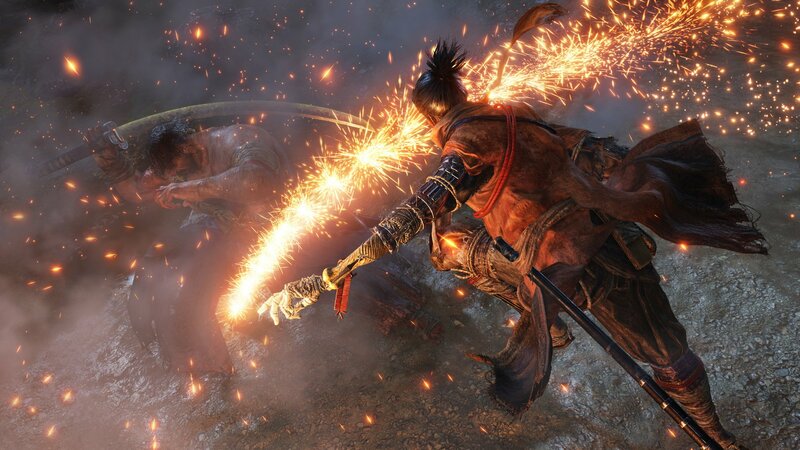 The combat in Sekiro is quite unlike anything encountered in Miyazaki’s previous titles, it’s more akin to the swashbuckling escapades of Assassin’s Creed or Horizon Zero Dawn. However, the parrying mechanic – emerging from the clashing of blades – is key to the whole system. Success falls down the most effective posture, retaining balance while upsetting that of even the largest foes, gaining the upper hand to deliver ninja death blows. This is a full contact dance to the death, bringing all the shinobi’s tools into play for boss-like battles. 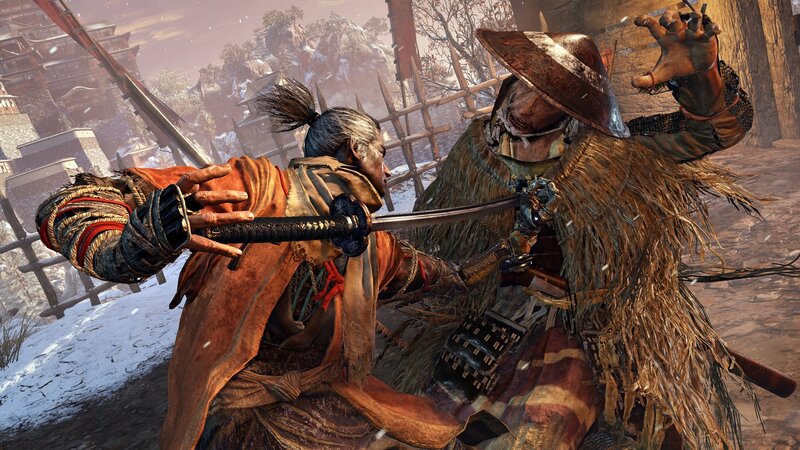 What other gameplay does Sekiro feature? 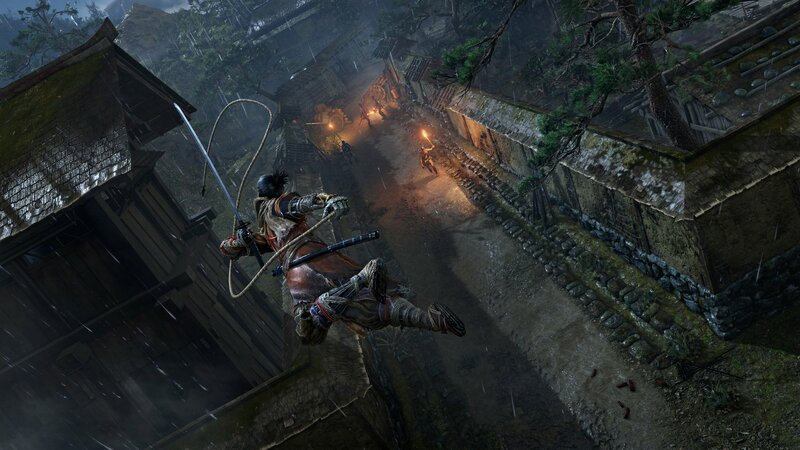 Similarities to the open-world adventures of Assassin’s Creed and Horizon Zero Dawn are also hard to ignore, owing to the way in which Sekiro is structured. Locations are seamlessly linked, encouraging exploration, and an increasing reliance on the grappling hook to find the best routes. There are NPCs encountered during these travels, in addition to those found in small settlements, which may be traders or quest-givers, but this is yet to be fully explained. Stealth is rewarded, using higher ground such as rooftops and trees, or by crouch-walking beneath floorboards to evade or launch surprise assaults. Again, this all seems very AC-like, in particular the strides taken by Connor throughout the wilds in AC 3. Long grass and soft meadows mask the sound of footsteps while serving as camouflage. There are ledge take-downs and assassination drops, emboldened by that incredibly versatile grappling hook. 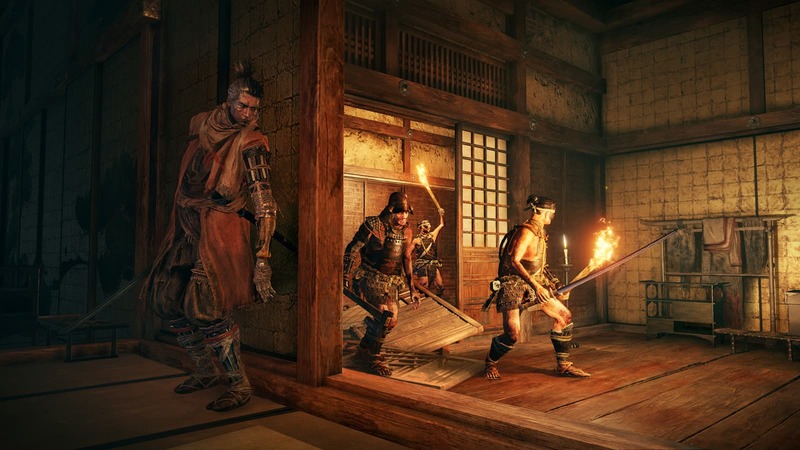 Where Sekiro does stand apart from its purely action-oriented peers is through RPG-like character upgrades, wherein equipment carried determines performance traits. Various associated skills, for example accuracy and power, are augmented through Ability Points. If past experience is anything to go by, this early airing of Sekiro has barely scratched the surface of what truly lies in store for our go-go-gadget ninja. The mystery of how he gets to self-revive – as seen in the trailer – is being flaunted by Miyazaki at this stage, but nothing more. There are further rumors of day and night cycles, combining with weather effects to make certain areas even more treacherous. We have such a long wait between now and early 2019, but there’s plenty to discuss before then about ‘Horizon Zero Souls’.